Sport is embedded in the cultural fabric of Australia and in the personal and social identities of its fans. It has the power to create (and sustain) highly identified and vested consumers, and to resonate with a broad range of demographic groups. Naturally, sport provides a powerful marketing platform for brands. Particularly when combined with the collaborative and immersive nature of social media. And Australian alcohol brands are aware of this. The findings from our recent study, Merging sport and drinking cultures through social media, explore how alcohol brands use social media – leveraging associations with sporting teams and events to facilitate active engagement with consumers and achieve key communication objectives for their brands. We found that alcohol brands commonly employ four sport-linked social media strategies (calls to action) to activate consumers. Call to compete: by leveraging the competitive nature of sport, this strategy attempts to engage consumers – and augment the sport experience – through promotional competitions featuring sport-related prizes displaying both sport and alcohol branding. Call to collaborate: this strategy actively pursues a higher level of engagement with consumers through co-creation of content or by stimulating user-generated content using sport as a common language. Call to celebrate: using sporting victory and shared camaraderie, this strategy seeks to embed alcohol as an integral part of celebrating and basking in the reflected glory of a team’s achievement. Call to consume: beyond celebration, this strategy seeks to normalise alcohol consumption as part of the overall sport experience, attempting to embed drinking as part of a consumer’s sport consumption practices and social interactions with ‘mates’. The social media strategies employed by alcohol brands go beyond promoting their products. They seek to normalise and routinise consumption as part of sport spectatorship, celebration or commiseration. These calls to action target consumers with product messages themed around sporting identity, culture and camaraderie. Beer, wine and spirit brands are presenting alcohol as integral to the sport experience, thereby blurring the lines between sporting and drinking cultures. The contemporary sport consumer has changed radically in just a few, short years. They want to know what is going on, and they want to be able to find out ‘24/7’. As technology continues to advance, the use of social media as part of the sport experience will only increase. Many sport fans already refer to their smart phones for extra value-adding content during events. And because attending live sporting events can be expensive, sport consumers often find alternative ways of engaging with the game and look for new ways to generate the excitement and buzz of the competition. Enter the alcohol brand and their approach to leveraging the sport-drinking-social media triumvirate. Alcohol marketers can use a variety of digital platforms, where a focus on one or two can seed others. At present three social media platforms dominate: Facebook, Twitter and YouTube. Alcohol brands can also utilise smartphone applications, push notifications, trivia and tipping competitions, celebrity endorsements, promotional merchandise, videos, memes and co-created content linked to sport to engage with consumers and gain access to their extended social networks. The findings from this study suggest a number of implications for policy makers and regulators as well as a number of questions for further research. For example, what type of social media content, and frequency, is appropriate for alcohol brands that are looking to leverage their association with sport? Are the messages linking sport and alcohol more likely to appeal to consumers under the legal drinking age? And what kind of mechanisms can be used to monitor or regulate social media activity by alcohol brands? Existing regulatory frameworks have not kept pace with the dynamic and rapid growth of digital media. Regulators are challenged by the global nature of digital media and the significant investment being made by alcohol marketers to capitalise on a medium where their marketing activities are not always readily apparent. 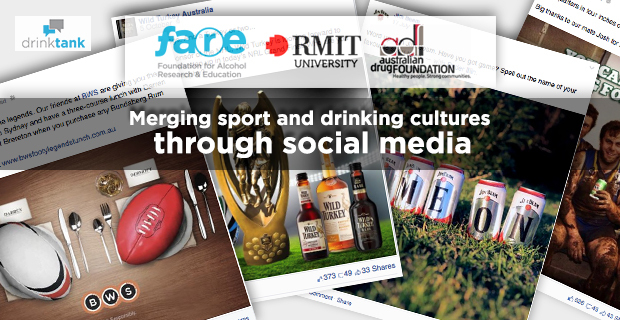 Policy makers and public health advocates will need to devise mitigating strategies to target social media users and de-normalise alcohol consumption around sport. This includes monitoring the evolution of alcohol marketing activities taking place through digital media. These findings emphasise the importance of establishing a deeper understanding of how alcohol marketers use various forms of social curation to drive engagement with their brand and ultimately consumption.